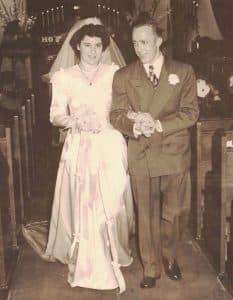 Dedicated to Mom and Dad – Kathy J. Marshack, Ph.D.
My parents, Irene and Paul, on their wedding day, August 29, 1948. My parents (Irene and Paul) gave me a rollicking childhood that alternatively scared me to death, and provided joyful adventures. it took me many years of therapy and two graduate degrees to get it straight, that my deeply flawed parents were enthusiastic about life, and loved me to their core. That love carried me through my father’s alcoholic binges, and my mother’s autistic meltdowns. Though Mom and Dad confused me when I was young, I came to forgive them, most importantly because the gifts they gave me are far more precious than bad memories. They bestowed upon me their intelligence, curiosity, adventurous spirit, discipline, resilience, and open-hearted embrace of God. How does it get better than this? In honor of their memory, I dedicate this website to these two incredible people who, grew up during the Great Depression, came of age during World War II, and became part of history in the “Greatest Generation.” I couldn’t have created the work I love as a psychologist, or this website to share with the world, if they hadn’t helped God polish my rough edges.